The example in the photos was made with a size H (5mm) crochet hook and Lion Brand Pound of Love yarn. Color A is Bubble Gum and Color B is Pastel Pink. Color bands are 5 rows tall, and the color A is used for first five rows and last five rows. Row 1: The first four chain stitches count as a double crochet in a stitch. Dc in the 7th stitch from hook. Yo, go behind that dc, insert needle in chain that is two before the chain with the dc and complete a dc (this is a dec-cdc). Work another dec-cdc. * Going across the chain, make one cdc, four inc-cdc, and four dec-cdc. * Repeat between the * across the row to last 13 chains. Make one cdc, four inc-cdc, two dec-cdc and one dc. Row 2: Chain 3 and turn (counts as a dc). Dc in the 4th stitch. Yo, go behind that dc, insert needle in front loop of second stitch and complete a dc (this is a dec-cdc). Work another dec-cdc. * Going across the chain, make one cdc, four inc-cdc, and four dec-cdc. * Repeat between the * across the row to last 13 stitches. Make one cdc, four inc-cdc, two dec-cdc and one dc which will be in the turning chain of the previous row. Repeat row 2 until blanket is desired length and finish off. Weave in ends. If seeing a chart of this would be helpful, I have a chart of two rows of one repeat here. There is also a tutorial video available here. Are the regular double crochets (not the crossed ones) being stiched through the front loop or both front and back loops? I just stitch through the front loop. I know a lot of people regularly stitch through both loops, but I’ve always just stitched front loops unless otherwise indicated. Most of the guides also show front loop only as the standard, but I know there are notable exceptions to that. I would just recommend being consistent. I think the blanket will look great either way. If you generally always stitch both loops, do so on the crossed stitches as well. i do not often try different patterns. because i do not most often understand the patters. this one i can do and have done. it was great and i understood it all. I just want to say that I have always had so much trouble doing Ripple afghans that I usually quit after the first row or two. All of your works is explained so well that I’m going to tackle this one for sure. Thank you for your lovely patterns! I am new to your site. I am very excited that you have patterns that can be used for Lap Blankets. This one is similar to one I use for big afghans. I didn’t know how big one should be so this is great. I hope this is ok to ask, what would something this size sell for? I am used to making baby blankets and large afghans, but don’t have a feel for the going rate on something like this. If you can give me your impression that would be very much appreciated. Thanks again for this lovely site. I honestly don’t know. I’ve only donated blankets or given them as gifts to friends. If you have a good idea of the going rate for a full sized blanket, I think it would be reasonable to proportion the price of the lap blanket based on proportional size, so perhaps base it on comparing the number of skeins. I love this pattern! I found it through allfreecrochet.com and am currently working on a throw size blanket as a Christmas present for my cousin. I added an extra 18+5 to make it a bit wider because my cousin is a lot taller than me. Anywho, just wondering of you’ve ever made this blanket with an edging or border? I’m looking to do that with this blanket, but not sure how to go about it. Any suggestions would be so helpful. I haven’t, but I would think single crochet on either side would be appropriate. The two ends have the scalloped shape, so are already finished looking. A throw size of this blanket should be very nice. Thanks so much for using my pattern. I have been doing afghans for years and for some reason I am confused with a part of this pattern. Hopefully it’s just me having a bad moment but if someone could clear this up for me I would appreciate it. The first four chains serve as a double crochet in a chain. You will double crochet in the 7th chain, then putting your hook behind that double crochet, make a double crochet in the 5th chain. This is the first dec-cdc. For the second dec-cdc you will make a double crochet in the 10th chain then put your hook behind it to make a double crochet in the 8th chain. For the regular cdc you will make a double crochet in the 12th chain and then put the hook behind it to make a double crochet in the 11th chain. For the first inc-cdc, make a double crochet in the 13th chain, then put the hook behind it to make a double crochet in the 12th chain (which already has a double crochet in it). I hope that helps get you going on this. I will have to try this one, just as soon as i finish 4 other started projects. I hope there are others who have more then one project going at the same time. God bless all of you. You can’t be serious! I have so many ‘in progress’ projects I’ve lost count! A memory quilt started about 4 years ago still in a box on the shelf in my closet, at least 4 crochet afghans and three needlepoint projects. I know I’m missing something – oh yeah – that Christmas cross stitch picture I started ten years ago that I work for an hour or so before my eyes blurrrrr (on a navy blue background – very hard to see, especially at night!). This just scrapes the surface of my unfinished projects – I get bored after a while and pickup something new or find a new pattern I just HAVE to try! I guess it’s the price for creativity, or procrastination. barbara, i loved your comment. i get going on a project (like my grand daughters afghan) almost complete it and get distracted with another which i may complete. right now i have at least 7 projects going and some to be frogged and never completed. LOVE! Thank you for this! I am new to this site but have a question. I lived in England for 4 years and while there I bougt a pattern for a complete layette done in the ripple pattern. Included hat, booties, sweater and blanket. Does anyone know where I might find the pattern? Thank You so much. I will try to get my camera man to help with that in the next few days. I am so sorry this took so much longer than I anticipated. I hope this video helps. Thank you so much for putting this tutorial on you-tube. Very helpful. I’m looking forward to starting. A friend’s mother dies suddenly and had a lot of yarn, so I’m making an afghan for my friend from her mother’s yarn. And really happy to be able to do this as a remembrance for my friend of her mom. I am new to crochet, and I printed the instructions to this blanket and the explanation given by mama, and I was able to do this blanket! It tool me just talking it out and following the directions. It took me 2 rows to figure out we were just simply making X’s out of double crochet. I am almost finished now, and made it in about 3 weeks but I only get to work on it 1 or 2 a week for a few hours at a time. I will be glad when its done, but it is beautiful and I am proud of myself for trying it! Thank you for sharing your pattern and thanks MAMA for explaining it. Q: I would like to make this blanket in a twin size. Could you tell me how many chains I need to start the pattern off with and how much yarn I should purchase. I would like to make this blanket for my granddaughter for Christmas. A typical size for a twin comforter or blanket is 68″x 86″. You will need about 5,000 yards of yarn and should start with a chain of 311. Thanks for the video. I messed it up badly twice and then watched the video. I’m rocking along now and doing great. Do you have this pattern for a full-size afghan? I added a chart with more sizes and added more beginning chain number options for more sizes. If you need an even bigger afghan, add multiples of 18 chains to the beginning chain. Thank you very much. It was so nice to get an answer to my question, and in such a timely manner! You have the most beautiful patterns I have seen. They are often delicate but also sturdy,just want to make them all! I have made none yet as am battling tendonitis but will start one as soon as possible. Love that you give starting chain count for so many sizes so we don’t have to do our own figuring. Simply beautiful work, Mama! I have now made three of these blankets. Two of them for little girls who are special needs. They call them ‘finger blankies’, since they are very touchy and tangling their little fingers in the stitches comforts them. I found this a challenge to understand, but once started, very easy to do. From my special little girls and myself, I thank you most kindly and can’t wait to explore more of your designs! Thank you so much for sharing that. That makes me so happy that they love their finger blankies. I am bookmarking this pattern to make for my secret sister! I’m excited to get started. Thanks for sharing!!! I am trying to find a crocheted pattern for a corner afghan. Can you help with this pattern. Hi, I just finished the Little checks blanket! it look beautiful I would like to make the corner afghan for my charity preemie knitir g! crochet group. Would you be able to give me the chart for that size and also for a typical newborn size? Please also email me the reply… Thank you. I enjoy your blog. I’m sorry, but to see if I can help, I need to ask some questions. Is this a pattern that appeared on an ad on this site? I don’t see the ads myself, and they can change at any time, so I have no way of knowing their content. I looked around and found a Redheart Corner-to-corner blanket. Is that the one you are referencing? When you are looking for a chart, what information would you like in the chart? I like the pattern but am having a problem when I come to the end of each row. The sides are uneven. I am not getting a straight edge. What am I doing wrong? How do you get to the last 13 stitches as per instruction and still stay with the pattern. (across the row to last 13 stitches. Make one cdc, four inc-cdc, two dec-cdc and one dc which will be in the turning chain of the previous row.) My stitches are off, It does not flow to the 13 stitches while following the pattern. I hope my explanation of the problem is clear. Have you looked at the stitch diagram for a couple of rows? (http://blogs.thetucker.com/knit/2011/10/25/chart-for-crossed-double-crochet-ripple-blanket/) It shows how the stitches from one row should line up with the stitches in the row below it. When going across each row, the center of the four dec-cdc stitches should always line up the the center of the four dec-cdc from the prior row. What a beautiful pattern! You did an amazing job! Love it! 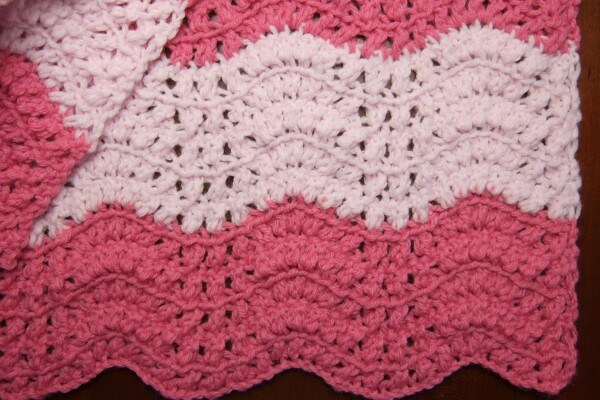 This blanket looks beautiful, I would like to make the baby blanket size for my baby girl. Do you know if I could substitute these yarns with Caron Simply Soft yarn? Both type of yarns are of medium weight. However, I’m not sure if Caron Simply Soft yarn is as soft as the Lion Brand Pound of Love Baby yarn for a baby blanket. I’m learning crochet and would really appreciate if you can help. Thank you for the pattern! I have made several baby blankets with Caron Simply Soft and think it is completely appropriate. It works great with this pattern. I’m having problems understanding how to do your reversible afghan pattern. I am using 3 different colors of green and when I start from the Row 1 it doesn’t coming out right and I’m getting so confused and aggravated. Then changing colors too! “PLEASE HELP ME UNDERSTAND” Thank You! >> I’m having problems understanding how to do your reversible afghan pattern. I am using 3 different colors of green and when I start from the Row 1 it doesn’t coming out right and I’m getting so confused and aggravated. Then changing colors too! “PLEASE HELP ME UNDERSTAND” Thank You! Can the afghan hook be used to make this blanket? I don’t think so used in the traditional way the hook would be used. 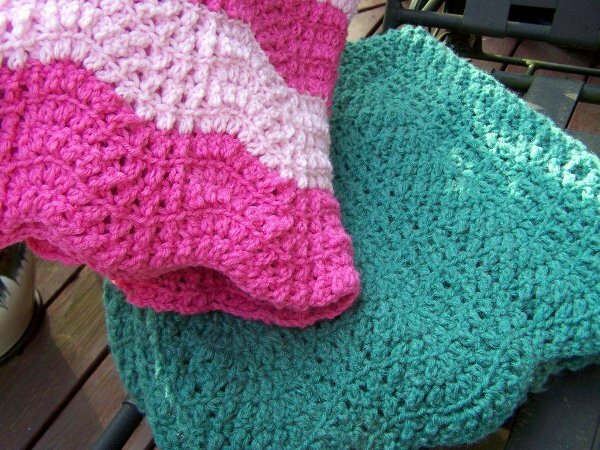 This afghan is made with double crochet stitches. Afghan (Tunisian) are more of a variant of single crochet stitches. 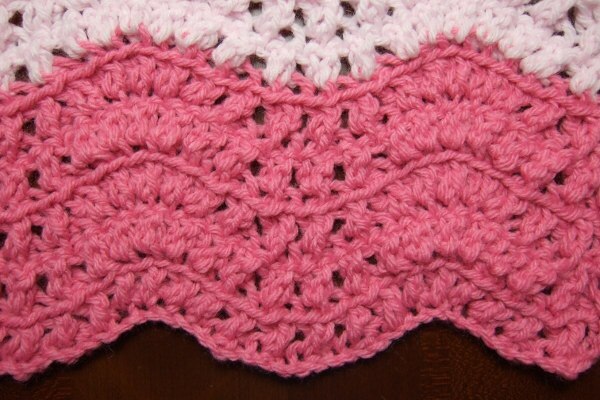 Can this pattern be done in just double crochet and not use the crossover part. Very new to this relaxing art and I am a very hands on learner. I am going to check out your video but was wondering a head of time in case I still have problems. Thank so much, it is great that you are still answering our questions after all this time, very generous. Stumbled upon your pattern when I was looking for a different ripple pattern. I consider myself an easy+/intermittent self taught crocheter, so can’t wait to challenge myself with this pattern. It’s gorgeous! Thanks for all of the different sizes too…. You can just print them. There is a printer icon at the top of the patterns that you can press that will produce a clean copy without comments that is ready to print.